2nd and 4th Monday 7:00 P.M winter & 7:00 P.M DST . The Brazoria Lions Club was chartere d on November 18, 1947. Our motto is "We Serve". We have a number of ongoing projects for those in need in our community such as collecting eyeglasses for recycle, eye examinations & glasses for children & loaning out medical equipment for those who can't afford wheelchairs, beds, etc. as well as sponsoring youth sports & other community help organizations. We also support the Lions Camp for Handicap Children & Children with diabetes in Kerrville, TX. Each year we sponsor campers & help them get there to enjoy the activities. Applications for campers are available in the Forms section. The Brazoria Lions Club hosts an annual "Gun Raffle" (now in proress) to raise funds for service projects in the community. This years raffle includes 96 hunting riffles, 3 zero turn lawnmowers & a Polaris four wheel drive side by side. Past projects have included the building of a pavillian at the the American Legion park, a pavillian at the Brazoria Heritage Foundation, a walking track at Barrow Elementary, wheel chair ramps, a porch rebulding & a play park near the fire station. 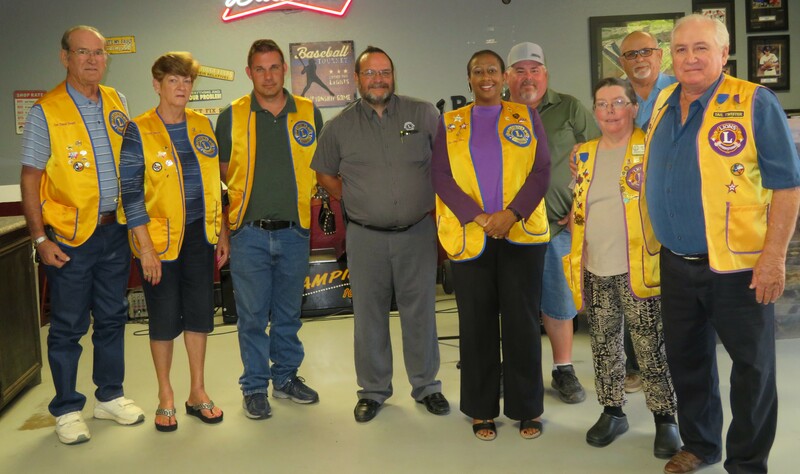 The Brazoria Lions Club named its 2016-2017 officers at their regular meeting, July 11, 2016. New officers for 2016-2017 are as follows: President, Jerry Measells; 1st Vice President, Roy Edwards; 2nd Vice President, Gary Kersh; 3rd Vice President, Kurt Buchanan; Treasurer, David Jordan; Secretary, Gloria Powell; Tail Twister, Roy Compton; and Lion Tamer, Darrell Powell. The new Board of Directors are: Frank Petteway Sr, “Bubba” Davis, Charlotte Hopkins, Carol Ann Davis, Scott McCaskill and Marie Hicks. In addition to the officer installation, awards were presented to deserving Lions, including several 100% attendance and special President’s Awards. Outgoing President, Lion Frank Petteway Sr. received an award for his service to the organization. Lions Marie Hicks and Carol Ann Davis were awarded lifetime memberships from their service as sectary and treasurer, respectively. The Brazoria Lions Club meets the second and fourth Mondays of each month. For more information on the Brazoria Lions Club, call 979-798-4444. The community is grateful for the 25 years of the Brazoria First Assembly church and Pastor Dale Frankum’s July 4 presentation of Celebrate America, and delighted that the Brazoria Lions Club has taken over the reins of the 2019 event. Over the years, Celebrate America and the largest fireworks display in the county had become Brazoria’s well-received calling card drawing people from miles around. Losing this event, would be catastrophic. But the coordination and expense to produce this event is overwhelming at best. Celebrate America will again fill the skies with fireworks and the hearts of the community with pride on July 6, 2019. The Brazoria Lions Club was looking for another community project and unanimously voted to continue staging this well-loved event. Celebrate America will utilize Barrow Elementary’ s grounds as in the past, continuing this prominent project. The Brazoria Lions Club is working with sponsors to help defray the cost so that the event can continue with the success it has had in past years. Celebrate America will continue to be offered to the public for no charge. 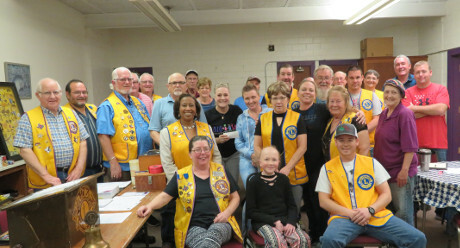 March 11, 2019, The Brazoria Lions Club presented Shannan Murray, Director of Development for B.I.G. Love (Brooks’ Incredible Gifts) a check for $2,000.00 to support their efforts/ B.I.G. Love is a 501c(3) non-profit, volunteer based organization committed to providing basic necessities and personalized care to cancer kids and their families at : Texas Children’s Hospital (Houston), Dell Children’s Hospital (Austin), and The University of Texas MD Anderson Children’s Cancer Hospital and beyond. 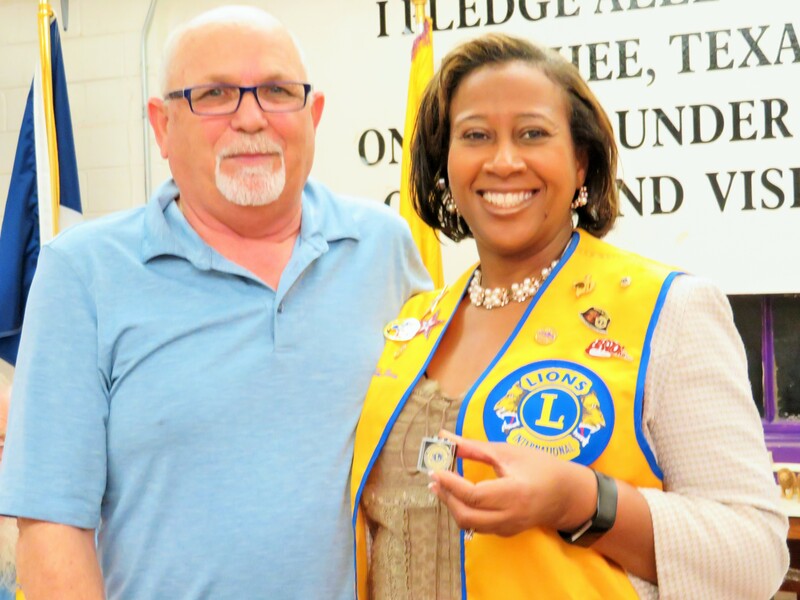 March 11, 2019, the Brazoria Lions Club’s president Lion Gary Kersh (L), awarded Lion Tina Dixon (R), an appreciation pin for her dedicated work on arranging speakers for the Brazoria Lions Club meetings twice a month. The Brazoria Lions Club conducted a free vision screening at the Brazoria Operation Head Start on August 17, 2015 from 9 a.m. – 4 p.m. A total of 45 vision screenings were conducted and 5 children were identified with vision deficiencies. The purpose of the screening was to determine whether or not vision correction is required. The equipment used to check vision, is quick, painless and can accurately identify vision problems in a few seconds. At the end of the screening, a print out of the results was given to each of the participants (or parents). Those needing eye correction can take the print out to an eye doctor of their choice. Brazoria Lions Club members (who are not eye doctors) conducting the screening were Gloria Powell, Roy Edwards, Jan Edwards, and President, Frank Pettaway. The screening is an outgrowth of the Lions International initiative better vision for all. This vision screening is targeted for children ages 6 months – 6 years old because it has been determined that if problems in young eyes can be found soon enough, corrections can be made so that glasses will not be necessary later in life. Though the event is especially targeted for children, people of any age can have the screening done at no charge. For more information or to schedule a screening, call Lion Gloria Powell at 979-964-4028 or the Brazoria Lions at: 979-798-4444. Lion Gloria Powell (left) conducts a vision screening on Carlito Saldana at the Brazoria Lions Club Project Head Start vision screening August 17, 2015 in Brazoria. If you are interested in helping the Brazoria Lions serve our community as members or to donate to our programs, or if you know about a handicapped child or a child with onset diabetes who would benefit from the Lions Camp please contact a club officer or call (979) 798-4444 or email brazorialions@gmail.com. 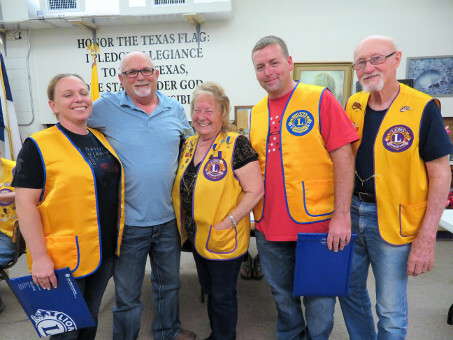 The Brazoria Lions Club President, Lion Frank Petteway Sr. (L), presented Irma Pingenot (R), Community in Schools Site Co-coordinator for the West of the Brazos Junior High School of the Columbia-Brazoria ISD, with 15 backpacks at their regular meeting, November 23, 2015. The backpack program provides meals for disadvantaged students during the school year. Lion Frank Petteway is a substitute teacher for the West of the Brazos Junior High School. The Brazoria Lions have contributed more than $160,000.00 to the Brazoria Community Library. Dr Robert L Schwebel DVM - Presents Q U I K H E A L "The Miracle Cream"
Quik Heal is a microcrystalline combination of Aluminum and Magnesium Hydroxides that possesses anti-bacterial, anti-fungal and anti-yeast properties.